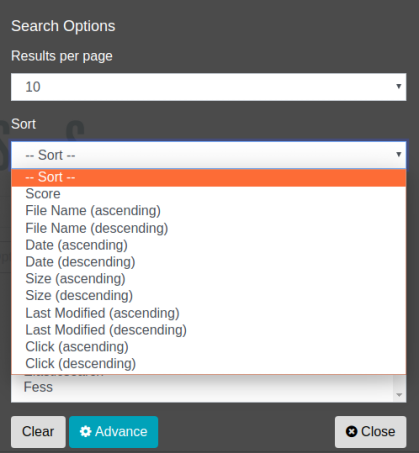 To select sort field in Search Options dialog, the search results are sorted by the field. The following sort fields are available. To click Options button, Sort fields are selectable on Search Options dialog. In addition to selecting sort field on the dialog, sort prefix operator is available in query syntax. The format is colon-separated query, such as sort:fieldname. To sort search results which contains fess by content size, the query is below. To sort in descending order as below. If you want to sort by multiple sort fields, it’s below.